This Christmas has been the season of giving, not getting, for an 8-year-old boy in New Jersey whose home has become a bit like Santa’s workshop. 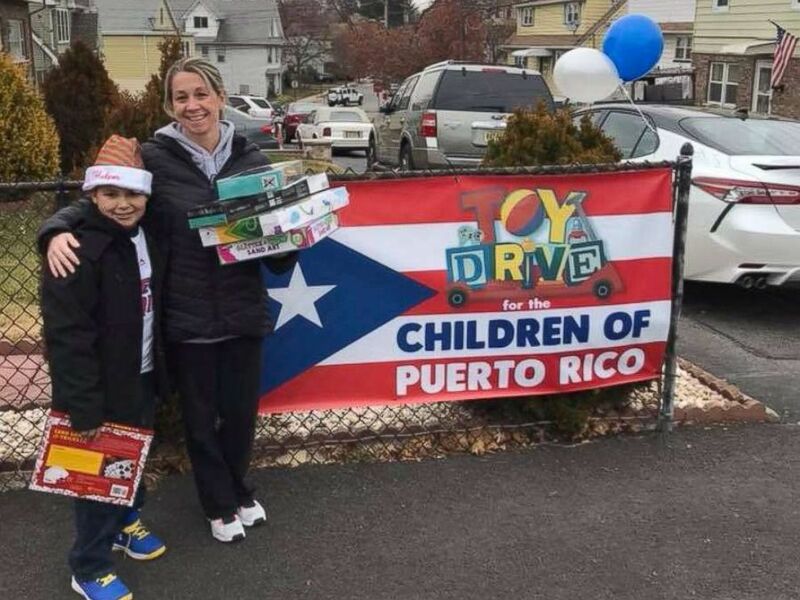 On Dec. 3, Jayden Perez, a third-grader in Woodland Park, New Jersey, held a toy drive at his home to collect toys for children in hurricane-ravaged Puerto Rico. His mother, Ana Rosado, told ABC News today that in September, her boss had given Jayden, a New York Giants fan and football lover, one pretty epic gift: tickets to a Giants game. Rosado said it was a gift just because, not for Jayden’s birthday or any special reason. On video, she captured Jayden breaking down in tears of joy after being given the tickets. Rosado said that also around that time, Hurricane Maria hit Puerto Rico. She and Jayden volunteered to help. The two collected donations and helped pack and ship them out. She said the two helped put together more than 40 boxes. After Thanksgiving, Rosado said Jayden came to her with his own, new idea: He’d been blessed with Giants tickets so he wanted to pay it forward to the children of Puerto Rico. Jayden told her that he wanted to donate his Christmas gifts to the children but Rosado took it a step further: have a toy drive. Rosado posted the event on social media and word spread with help from local media outlets. She said that so far, the drive had netted more than 1,000 toys but that there were more toys coming this week. Rosado said a man had even reached out to her from Pennsylvania, saying he had a trailer of toys that had been donated from his community. She said that a shipping company was also helping them to get the toys to Puerto Rico. Initially, Rosado said, two of her friends had planned to fly to the island to help distribute the toys. But, she said today, she and Jayden would now be going Jan. 4 to celebrate Three Kings’ Day. It will be his first trip to the island, she said. Rosado said they planned to bring some toys to an orphanage that had reached out to her for help and then they’d travel Jan. 5 and Jan. 6 to several small cities that had been hit hard by Maria. So far, Jayden has more than 30 boxes of toys packed up and ready to be shipped.